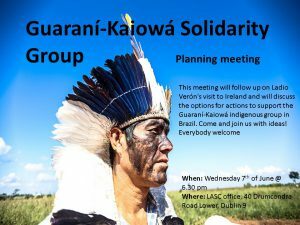 During his visit to Ireland, Ladio Verón, leader from the Guaraní-Kaiowá indigenous group in Brazil, made a call to create a solidarity network in Europe to support his group. At this first meeting, we want to bring together people and ideas to start working on it. Everyone welcome!